Infrared photography for aesthetic purposes is widespread and fine-art examples are pervasive in the world of photography. 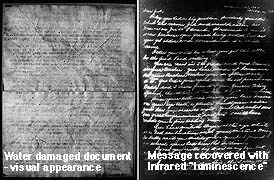 In the several examples shown below some of the more unusual applications of IR imaging are illustrated. The photographs above were made with an Agfa ePhoto 1280 camera. The color photograph was made with the camera in automatic mode. 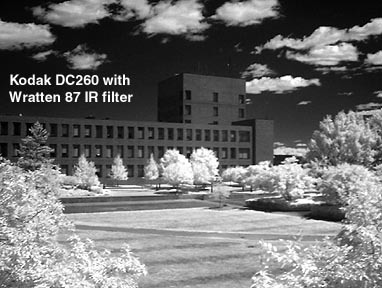 The B&W photograph was made with the same camera but a visually opaque Wratten 87 infrared transmitting filter was placed over the camera lens. The camera was set to manual exposure mode and the exposure was adjusted to the highest level possible. Also, the viewfinder was set to "candlelight" illumination and easily served to preview the final scene. 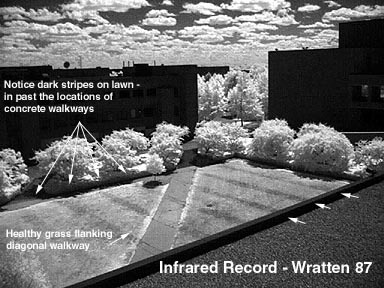 Note that the infrared record reveals the past presence of concrete walkways where currently there is an unbroken grass lawn. 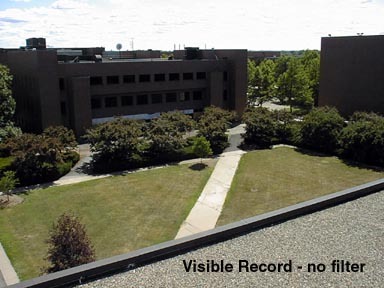 Those concrete walkways, invisible in the visible image, have been covered up by soil and grass for about 15 years as of July 1999. It has been pointed out that there is some evidence of those parallel walkways in the wider, diagonal, one. This is true but this is not due to infrared "prints" but simply to the fact that there are indentations in the diagonal path where it is crossed by the other ones. It is interesting to note that the builders chose not to simply pour a new, unbroken, concrete path but rather left pieces the old ones in place. 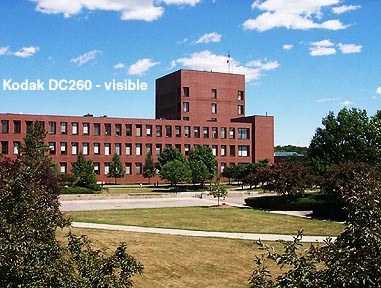 Above is a pair of photographs taken with a Kodak DC260 camera of the same general scene as the top pair. The visible record was made in automatic exposure mode. The IR record was taken at an exposure time of 1/2 second by setting the camera's shutter speed control to manual. Note how the concrete and the blacktop changed from a light tone in the visible photograph to a dark tone on the infrared one. Evidence of anomalies in the grass correspond to those seen in the Agfa photographs. The 2 photographs below are panoramic, encompassing 360 degrees. They were made with a panoramic digital infrared camera I made myself by "gutting" a cheap print scanner. These photographs were taken in front of the School of Photographic Arts and Sciences where I did not only a "visible" B&W record but also made a matching Infrared record of the surrounding landscape. An article where you can read about this improvisation is available HERE. In this case I was invited to join a group of art historians and restoration specialists on a study conducted at the Prado Museum in Madrid, Spain. 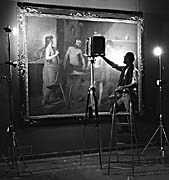 Our task was to document and study the restorations conducted on the paintings as well as the "pentimenti" ("changes of heart" of the artist re: his painting) that Velazquez authorized others to perform or completed himself on several of his paintings. 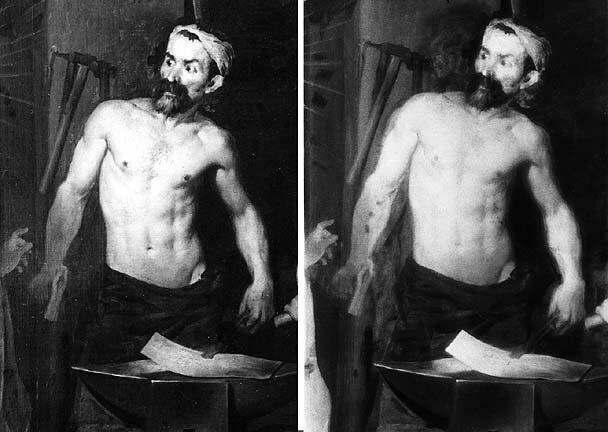 It is easy to see how in this painting the figure of Vulcan in "The Forge of Vulcan" was extensively changed. Particularly evident and interesting is the change in the position of his head, his right arm and hand and that of the hammer he is holding. There are also several other changes. Can you pick them out? 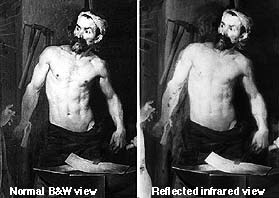 To access an overview document on principles of Infrared and Ultraviolet photography take a look at this Fundamentals of IR/UV photography article. This is a somewhat rare example where the technique of Infrared Luminescence (as H. Lou Gibson would call it) or Fluorescence in the Infrared (as I think is an equally valid way to refer to it) shows off its surprising ability to make visible a subject that gives our eyes very little or no clue as to its existance. The subject was a letter that had been placed in a home-made time capsule and buried near the cornerstone of a private home. 20 years later it was unearthed and to the dismay of the family all the words written by the mother of the family with pen and ink were washed away by water that had infiltrated the box. 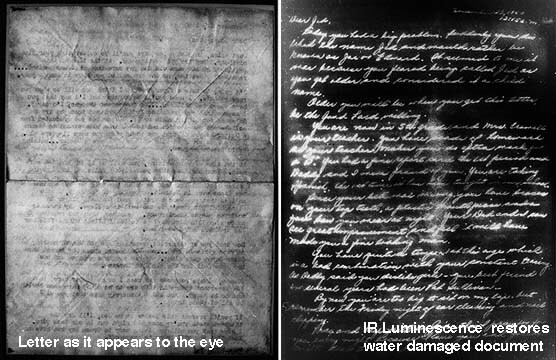 The residual ink remaining in the paper was quite invisible to the naked eye but when illuminated by light devoid of infrared wavelengths, these inks fluoresced in the infrared. An infrared transmitting filter placed over the lens allowed only these newly formed wavelengths to pass on to the film, which was Kodak's High Speed infrared material. Needless to say the by-now grown-up children of family were elated to be able to see these hand-written messages destined by their mother to be read 20 years into the future. Note that the writing appears as white on black even though the paper is in reality white paper. This is due to the fact that the fluorescing inks create density in the film and thus reproduce as lighter than the white paper which does not fluoresce. You can contact me at RIT at andpph@rit.edu. Select ARTICLES for an extensive listing.